Russian lawmakers urged Congress last week to reconsider the Magnitsky bill, but so far have gotten the opposite result. If passed, the Magnitsky bill could derail US-Russian relations for years Russian Senators said. Several members of Russia’s Senate, called the Federation Council, made a rare appearance in Washington, D.C., this past week in a last-ditch effort to convince their American peers to reconsider the controversial Magnitsky Bill—a piece of legislation that Moscow considers to be explicit interference in the internal affairs of the country. Russia’s Ministry of Foreign affairs has repeatedly warned Washington about the consequences of this legislation. The Magnitsky Bill sanctions a number of the Russian officials that the U.S. Congress has deemed responsible for or are connected to the case. Opinion: Will the Magnitsky bill “replace” the Jackson-Vanik amendment? Opinion: Magnitsky for Jackson-Vanik: A fair trade? In 2008, Sergei Magnitsky said that he had uncovered a scheme that top officials from Russia’s Interior Ministry and other agencies had created a plan to defraud the Russian government. Two of the officials turned around and implicated him for tax evasion on behalf of his client, the investment firm Hermitage Capital headed by William Browder, then a longtime cheerleader for President Vladimir Putin. Magnitsky died after a year in pre-trial detention, during which his health deteriorated dramatically; Russian investigators found he had been beaten while in prison. While the Russian government has stressed that any human rights investigations should be conducted internally, Browder has headed an international investigation of his own and become one of Putin’s fiercest critics. If the bill passes, it would significantly undercut ties between the two countries, derail cooperation on certain matters and trigger Russian retaliation, Russian officials in Washington claimed. However advocates of the bill say that the official Russian reaction has only served to increase interest in the legislation. “Every time Russian officials or members of State Duma or the Federation Council warn the U.S. Congress about the implications of the Magnitsky bill, support for this legislation only increases,” said David Kramer, who heads the Washington, D.C.-based Freedom House. Russian lawmakers presented their preliminary findings regarding the circumstances of Magnitsky’s death. The delegation met with several key American lawmakers including co-sponsors of the controversial Magnitsky Bill, U.S. Sen. John McCain (R-Ariz.) and U.S. Sen. Roger Wicker (R-Miss.) as well as U.S. Rep. James McGovern (D-Mass.) who put forward a House version of the bill. 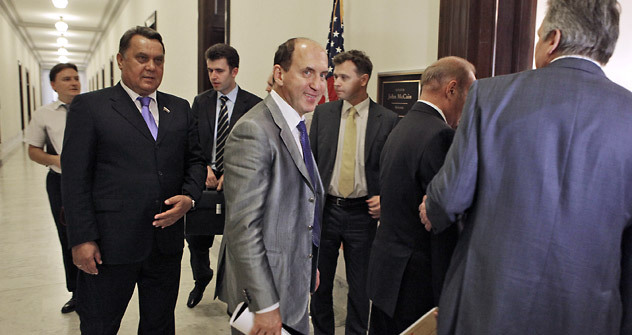 The Foreign committees of both the House and Senate endorsed the legislation last month. The Senate Finance Committee Chairman Max Baucus is expected to bring the bill before his committee later this month. According to the results of the parliamentary investigation, a “lack of adequate medical assistance” contributed to or even caused the death of the Hermitage Capital tax lawyer. However the Russian Senators also stated that they believe Magnitsky was involved in tax evasion and thus was not wrongfully charged, Malkin told Russian and American journalists during a press conference held at the Russian Embassy in Washington. The scheme cost Russian taxpayers $230 million. The Russians also allege Browder repeatedly broke the law by illegally acquiring shares of Gazprom and falsely registered some of his companies to minimize or otherwise avoid paying taxes. In return, Browder, who was an American citizen before renouncing it and acquiring U.K. citizenship, claimed that in fact it was Russian officials and law enforcement officers who managed to steal huge amounts of money from the Russian budget while demolishing his business at the same time. U.S. lawmakers also recently watched a new documentary film sponsored by Browder that alleges an organized criminal gang was also tied to Magnitsky's death. The documentary charged that the gang, the Klyuev group, has connections to the highest levels of the Russian government. In a recent interview with Russia’s Vedomosti newspaper, the Russian businessmen Dmitri Klyuev rejected all the claims in the film as groundless and accused “Bill Browder and his talented lobbyists” of misleading American lawmakers. Nevertheless, the documentary appeared to have had an impact. After a Capitol Hill screening, there were sharp remarks from Rep. Ileana Ros-Lehtinen (R-Fla.) and McGovern as well as Kramer on the deterioration of human rights situation in Russia. After meeting with the Russian delegation, McGovern said “this visit made the case even clearer.” He said his questions remained unanswered: “If the point was to change my mind about the Magnitsky bill, then this trip was a failure,” he said.